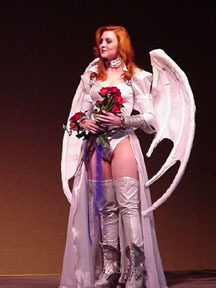 Welcome to my photo review of DragonCon 2001. There are many reasons why people go to science fiction conventions. There are panel discussions, game playing, and the speakers are usually very good. One gets the opportunity to meet their favourite star or writer. But for me; the contests, the concerts, and the people are why I go back every year. On this website you will see some of the hundreds of pictures I took over the four day convention: most are costumes and goths, my favourite subjects. These people spent a lot of time and effort on their look and I'd like pay homage to that with a good picture. Please look around and admire the sights. My address is at the bottom of every page, I'd love to hear your comments.